Editorial Manager is used by thousands of journals and millions of users. A fast-growing percentage of these users (authors in particular) are non-native English speakers. Reaching out with local language interfaces is a tangible way for publishers to build relationships with local scholarly societies, universities, and government bodies. It’s a great way for publishers to signal their strategic commitment to local markets in China, Japan, France, Germany, Brazil, and throughout the world. 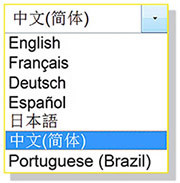 Within Editorial Manager deployments, it takes just a few minutes to activate one or more of the available languages (Simplified Chinese, Japanese, German, French, Spanish, Brazilian Portuguese) or any combination of languages. For English language journals, the language options appear in a drop-down list on the main menu bar so that users can select the appropriate interface with a single click. The language options are available for author, reviewer, editor, and publisher roles and can be activated in ProduXion Manager as well Editorial Manager. This means your journal can run an end-to-end workflow in your preferred languages.